The Pantech Discover's messaging department, unsurprisingly, boasts a rich functionality. Messages can be arranged by a date or contact name. Adding multimedia to a message automatically turns it into MMS. Moving on to email, the Gmail app supports batch operations, which allows multiple emails to be archived, labeled or deleted. Multiple Gmail accounts are also supported. The latest major update finally can fit messages to the device's screen, as well as gives you the option to zoom in on them. In terms of text entry, you have two options out of the box in the Pantech Discover - an Android keyboard from the manufacturer, as well as the award-winning SwiftKey keyboard. The latter is arguably the best input method for Android, so we were pleased to see it preinstalled - it saves you a couple of dollars. The Discover uses the standard Android ICS gallery. The gallery automatically locates the images and videos no matter where they are stored. It even imports the online photos from your Google Picasa web albums. Two-finger tilt zoom works much like the name suggests. You touch the screen with two fingers and as soon as you start tilting it, it will zoom in or out according to the tilting motion. The standard music player of the Pantech Discover has all the functionality you will ever need. You have equalizer presets at your disposal, as well as the option to create your own. 3D sound effects are also on tap. When playing, you can access the player straight from your homescreen without unlocking it. Naturally, it is also available in the notification area once you do. The Pantech Discover's video player offers pop-up play too - a move taken straight from the Samsung Galaxy S III playbook. In the case of the Discover, it is called mini videos. 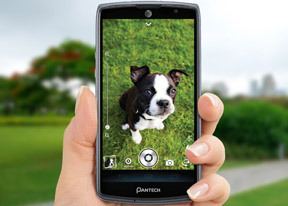 The Pantech Discover handled all major video formats without breaking a sweat. Large files were also a go, due to the beefy CPU and chipset. Be aware though, that the 720p LCD display eats into the battery quickly. The dual audio speakers are a great companion to the video player. They offer great sound experience when watching videos in a casual setting.